With a total of 10 MW of solar power scheduled to be installed by this coming summer, Arizona State University will soon have the largest combined PV solar power system of any U.S. university. By the end of 2011, ASU could have PV systems representing about 15MW installed among four campuses. The work has been divided into three phases. Phase 1 was completed in 2008, and phase 2 is scheduled for completion in June. Phase 3 is still in the preliminary planning stages. With a total of 10 megawatts (MW) of solar power scheduled to be installed by this coming June, Arizona State University (ASU) may be more appropriately dubbed Arizona Solar University. 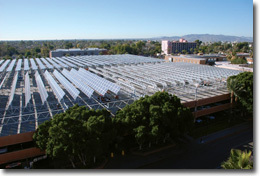 The Tempe, Arizona-based educational institution is also home to the Photovoltaic Testing Laboratory, one of only three such facilities in the world. It is located in a region that has more than 310 sunny days annually, which the university hopes to take advantage of with an aggressive photovoltaic (PV) system construction program. By the end of 2011, ASU could see PV systems representing about 15 MW installed among four campuses, says David Brixen, associate vice president of university services. The four sites are the Downtown Phoenix Campus, the West Campus in Phoenix/Glendale, the central Tempe campus, and the Polytech Campus in east Mesa. The work has been divided into three phases. Phase 1 was completed in 2008, and phase 2 is scheduled for completion in June. When that occurs, ASU will have the largest combined PV system of any U.S. university. Phase 3 is still in the preliminary planning stages, but it has the potential to yield another 5 MW by June 2011, Brixen says. If the goal is reached, it will represent about 40 percent of the four campuses' power demand (though not 40 percent of their total consumption). Most of the installations have been roof mounts. The exceptions are two ground-mount systems, a 1.976 MW system planned for the West Campus and a 3 MW system planned for the Polytechnic Campus. "We don't have a lot of land available for ground mounts," Brixen says. "Ground mounts are the most efficient in terms of costs, but we're limited in the ground space. We're doing more parking lot shade structures, which are so important in this area." To be considered for a roof-mounted PV system, a rooftop must be relatively new and free from equipment or other obstructions, he says. Officials also look at nearby buildings or plans for nearby buildings to ensure that the potential solar installation won't be shaded. "From my perspective, my job is to do what we can to install as much solar energy as we can, where it makes sense," says Brixen. "We've identified it up through phase 3. We've identified essentially most of the buildings that would make good candidates for solar." 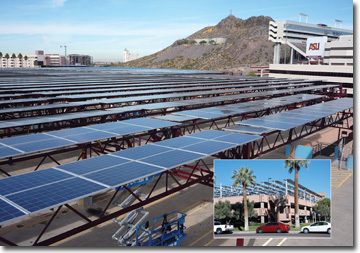 ASU installed its first PV system, which consisted of 30 KW of laminates applied to canopies that shaded 44 spaces in the Tyler Street parking structure, back in 2004. Necessity is the mother of invention, as the old adage goes. So when the Arizona economy slowed, and the need for traditional steel erection construction all but disappeared, Ironco Enterprises took its knowledge and applied it to solar installation and infrastructure fabrication. "We're a builder. The only thing we've done differently is trained and educated our workforce around solar," says Joe Banks, vice president of Ironco operations in Phoenix. "What we do is we just make and install more efficiently. We add value by reducing costs. What we're trying to do is introduce traditional construction means and methods into the solar industry." division that specialized in solar installation. Since then, Ironco has acted as a subcontractor all the way up to the general contractor offering turnkey projects, he says. For the Arizona State University parking structures PS 1 and PS 5, Ironco acted as a subcontractor and did most of the engineering of the fixed mounts, which had a 15-degree tilt. The company worked closely with project contractor ViaSol Energy Solutions of Tempe, to design and fabricate the racks themselves. Work began July 15, and Banks says Ironco completed its end of things Aug. 16. As part of the project, iron workers bolted on glass PV modules, much to the surprise of some onlookers. "They were amazed the iron workers did that and didn't destroy any modules," Banks says. "At the end of the day, it's nothing more than bolts and holes." Brixen credits three students under Harvey Bryan, a specialist in building technology, with initiating the university's current solar movement. The three surveyed 38 rooftops on the Tempe campus and identified roofs that would be good candidates for roof-mount systems. "They identified 25 rooftops where we could install more than 4 MW, so it grew from there," Brixen says. The university is also a member of the American College and University Presidents' Climate Commitment and has pledged to purchase or generate 15 percent of its energy from renewables. In addition, ASU has set a goal of being carbon neutral by 2025, Brixen says. "If we shifted a significant part of our energy to renewables, that reduces our carbon footprint," Brixen says. But that is only one piece of the puzzle. Another piece is by conserving energy, he says. The university has a $40 million performance contract that will fund retrofitting of interior and exterior lighting, replacing pneumatic controls with Direct Digital Controls (DDC) in 18 buildings, upgrading laboratories and lecture halls with sensors and variable flow devices on fume hoods and air distribution systems, and developing an energy dispatch optimization model for campus central plants. "It will reduce the need for air exchange at higher levels to lower levels based on the conditions within the buildings, which saves substantial energy," Brixen says. "It reduces the amount of outside air that we cool, which is an issue here because there's so much heat." Nearly all of the PV systems on the campuses are owned by third parties, which maintain and operate them, Brixen says. In return, the university is able to buy the power at a contracted rate. "So the university has no upfront capital expenses," he says. "We provide the space, they install the equipment, they own it and operate it, and the term goes up to 20 years." Each site has a different Power Purchase Agreement. Take the canopy systems on the parking structures, known as PS 1 and PS 5, that were installed in late 2008 as part of Phase 1. "On the parking structures that are already in operation, the price we're paying is slightly more than what we would pay for energy from the utility providers," Brixen says. "However, we anticipate during much of the term, we will be buying the energy for less because we anticipate utility rates to go up a lot faster." The third-party arrangement also allows developers to take advantage of federal tax credits, since ASU would not be able to since it is a publicly operated educational institution. "And that gets passed along to the university in lower kilowatt hour rates." Arizona Public Service, the state's largest electric utility, also has provided residential and commercial customers-including the university-with financial incentives to install renewable energy systems. In return, the university surrenders its renewable energy credits to the utility. Phase 1 included 1.6 MW of solar installations that are owned and operated by Sun Devil Solar LLC, a wholly-owned subsidiary of Integrys Energy Services. The project involved SolEquity, Inc. of Scottsdale, and CarbonFree Technology Inc. of Toronto, Canada, as project developers. ViaSol Energy Solutions of Tempe, was the contractor, and ETA Engineering of Mesa, and Ironco Enterprises of Phoenix were subcontractors. 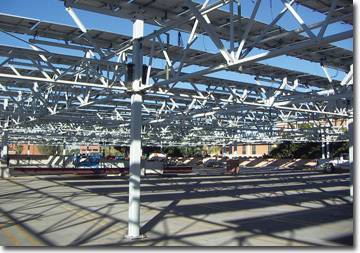 Apache Parking Structure (PS 1)-880 kW of single-axis tracking solar canopies. The 4,320 Suntech 200W polycrystalline panels were installed by SolEquity. ViaSol Energy Solutions LLC of Tempe manufactured the tracking system that rotates the PV modules on a north-south axis, producing about 30 percent more energy than a similar fixed mount system. The firm also designed the controller. Four Xantrex GT 250 kW inverters convert the DC power to AC. Stadium Parking Structure (PS 5)-711 kW of single-axis tracking solar canopies. The 3,510 200W and 210W polycrystalline panels were manufactured by Suntech and installed by SolEquity. As with the Apache Parking Structure, ViaSol manufactured the tracking system and controller. Three Xantrex GT 250 kW inverters convert the solar-generated power to AC. Lattie Coor Hall-108 kW fixed-tilt thin-film rooftop system. The panels were manufactured by First Solar of Tempe and installed by SolEquity. Phase 2 involves about 6.5 MW of projects. Two companies will provide solar systems and infrastructure-Independent Energy Group and APS Energy Services, which is also doing the installation on the West campus. Solar Power Partners of Mill Valley, California, will own and operate the systems. ASU is a member of the American College and University Presidents' Climate Commitment and has pledged to purchase or generate 15 percent of its energy from renewables. In addition, the university has set a goal of being carbon neutral by 2025. "We have preliminary designs done on all of the projects, and complete designs on one of the projects," says Rick Becker, senior accounts manager for APS Energy Services of Tempe. Plans called for them to break ground early in 2010. Of the total, 4.65 MW will be installed on two projects on the West campus, and about 1.86 MW will be installed on six projects on the Tempe campus. The major project on the West Campus involves a 1.97 MW ground-mount system comprising 7,320 Suntech 270 panels in an open area. A Duratrack-HZ single-axis tracking system from Array Technologies will allow the panels to follow the sun across the horizon. The second portion of the project involves three covered adjacent parking structures. It will use the same Suntech 270 panels, but they will be fixed at a 10-degree angle. The Tempe portion involves six different projects that total 1.859 MW. Fixed-mount rooftop systems will be installed on four buildings at 20-degree angles. Two parking structures also will be retrofitted with panels. All but one of the installations will use Kyocera 210 panels, with the remainder using Suntech 270 panels.